Payson McElveen (Orange Seal Off-Road Team) is best known for his endurance mountain biking, but last year, he decided to dip his toes in the gravel waters and the 2018 Dirty Kanza 200. The experience proved to be a rough one. With the endurance mountain bike races still down the road, McElveen decided to head to Stillwater for Saturday’s Land Run 100 and a shot at some gravel redemption. The race has become one of the top gravel races in the U.S. and accordingly, it attracted the best field to-date. After an early break and a few technical sections, McElveen made the break with Ted King (Cannondale / SRAM / Velocio / UnTapped) and Drew Dillman (SDG – Muscle Monster) and then outsprinted his breakmates to take the Men’s victory. How did he find that extra gear during the waning miles of the 103-mile race? A little self-motivation. 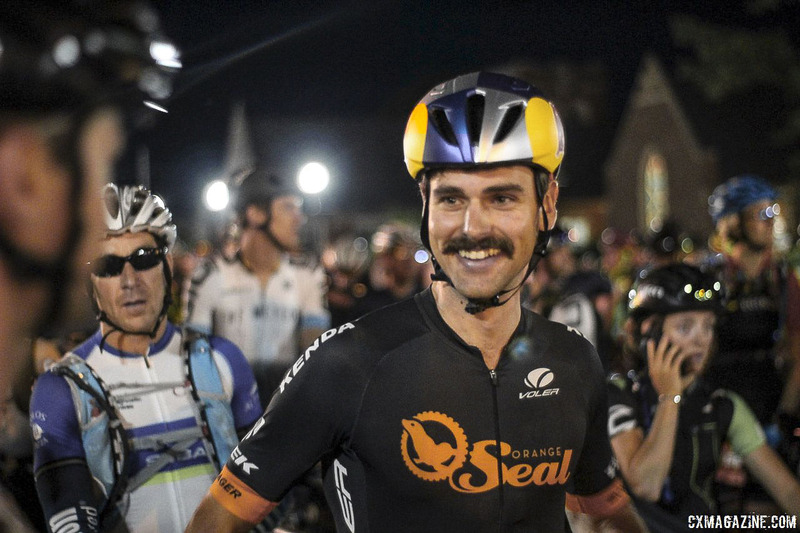 When he hits the start line, McElveen stands out because of the colors of his Red Bull helmet and because everyone knows the endurance skills he has, but also because of the moustache. Getting called out in race previews as a skilled ‘stache-sporter is not necessarily by accident. McElveen’s win on the red dirt roads of Oklahoma gave him some gravel redemption and a nice boost heading into his mountain bike season and try 2 at the Dirty Kanza 200 this June. I chatted with McElveen during his drive home to Colorado on Monday. See below for a transcript of our conversation. Stay tuned for an interview with Women’s winner Nina Laughlin. Cyclocross Magazine: A couple of days later, how are you feeling about the race? Payson McElveen: Good, good. Honestly, I’m impressed by the amount of attention it’s gotten. I knew it was one of the bigger gravel races, but it sort of reinforced my understanding of how big a deal gravel is getting. It’s cool. It’s motivating. CXM: For whatever reason, it seemed like you had an off day at DK last year, but you seemed to me to be a rider to watch. What is your background and how have you been transitioning into gravel? PM: It’s funny. This was kind of my third try at one of these more renowned gravel events. I did DK last year and did Rebecca’s Private Idaho and then Land Run this year, obviously. At DK I had just a whole bunch of mechanical issues. I actually had really good legs and a really good ride, but no one really knew about it because I was constantly bridging back to the lead group alone, over and over. Finally, I got tired of working on my bike at Mile 100 and decided to fold my cards that day. And then at Rebecca’s Private Idaho, I had a pretty nasty cold and probably shouldn’t have raced. It was good to finally get a clean run at one of these things. It was a heck of a lot of fun. Kind of the longer stuff is what I’ve been focusing on the last couple of years because that’s kind of a booming area of our sport, with events like the Epic Rides, the Leadville 100, all that sort of thing. I certainly still race some cross-country here and there. I took bronze at XC Nationals in 2017, I want to say, so I certainly still enjoy the shorter mountain bike stuff, but in terms of where sponsors would like to see us is where there’s a lot of energy and prize money these days. That’s in that longer endurance mountain bike stuff. I think I’m a little more naturally suited to it anyway, so for the time being that’s what I’m focusing on right now. CXM: An event like Land Run doesn’t have a payout, but we’re covering it and it’s obviously gained some prestige. Are you finding value for your sponsors in doing events like Land Run? PM: For sure. It’s funny, I had this conversation with a couple people the day after the event. Not many of the payouts have prize money at this point. If you look at the Leadville 100, it doesn’t have prize money right now. But there’s so much prestige, if you win it there’s bonuses and incentives involved from sponsors. Obviously, it can create more opportunities down the line. It sounds funny, but my mantra in the last 10 or 15 miles, Ted [King] was really throwing down attacks, I kept telling myself “Do your job, do your job.” Even though you’re not necessarily getting a prize paycheck today, my sponsors support me really well and I’m paid to win races. It doesn’t really matter what the prize money is, you still have a job to do. They’re supporting you to do that. I wanted to come through for that reason. And also because we race to win. CXM: I’m sure your glorious mustache would get a shout-out from us, but it’s probably better that you won. PM: Haha. It’s funny how culturally how much more value a win has over even and second or third, even if it’s just a bike length like it was on Saturday. It’s fun in that these grassroots events have so much more going on other than the racing, but at the end of the day, there is a lot of motivation that comes from chasing wins. Winning is fun. CXM: What team are you on? In Bikereg, you didn’t have a team listed. PM: It’s called the Orange Seal Off-Road team. It’s the second year of the program. CXM: The race itself, it looked like there was kind of an early break, based on my looking at the time splits on the internet, and then things came back together. How did the race play out to get to that final group of three? PM: It was a pretty dynamic event. Especially these Midwestern-style gravel races really play out like a Belgian Classic in that there are down periods that are not particularly challenging and then fairly tricky bits that really blow the race apart. There are a lot of tactics involved. As gravel gets more professionalized, we’re seeing bigger and bigger teams. There are teams of five to seven riders now, and that’s absolutely a dynamic to juggle, especially for a rider like me who’s an individual at the front of that race. Two riders rolled away pretty early. Ted and I were the ones who were kind of marking moves in the first 10 or 15 miles because it seemed like no one else really wanted to do anything. It was pretty clear how marked we were from the get-go. A couple times we tried to bridge across to that two-man group, and we would get like zero leash. Honestly, the first 50 miles were pretty frustrating in that regard. The racing was incredibly negative. The bigger teams really did not want to do anything. I guess that’s because we were kind of looked at, which created that sort of dynamic. I think we did a decent job of staying somewhat patient. At Mile 20 there was a pretty challenging quote-unquote rustic doubletrack section, what I mean by that is it was kind of grassy with some small rocks and it was tight and twisty. That went into about a two-minute climb. The pace didn’t necessarily get forced there, but I sort of rode my own pace, and the front got blown apart. It went from about 100 people to about 20. The lead group of two, because there was no cooperation in our group, I think their lead ballooned out to two and a half minutes at the halfway point, which certainly was worrisome. Then again at Mile 60ish, there was this pretty challenging two-minute, three-minute climb that was really soft and kind of rutted. I went to the front and rode it, and I don’t think many others in our group rode it. I didn’t attack, I sort of rode up it, and all of a sudden, I was with those two leaders. It seemed like they didn’t have a good time going up it. I found myself leading with these two breakaway guys. Then I was kind of thinking in the back of my head, ‘Ted is really strong and he’s got those aero bars. It’s wide open road and we’ve got 45 miles to go.’ Going for it at that point, I decided to wait up. Ted and Drew [Dillman] came across, and then at Mile 75 maybe, a rider kind of got messed up in a muddy rut and crashed a couple of us out. Luckily, it wasn’t too major for me. That splinted the group even more. That’s kind of what solidified out final group of three. And then honestly, we rolled pretty mellow. We were not pushing the pace and kept looking over our shoulders to make sure the gap was being maintained for that last 30 miles. Then with about 10 miles to go, I threw the first attack to kind of test the legs. Then Ted threw four or five others that would kind of drop Dillman, but he was able to fight back. It just became super cat-and-mousey, to the point we were almost track standing at points. Keeping an eye on each other. Again, the nature of gravel where there are very few rules, Ted was able to still run those aero bars. It created an interesting dynamic. If he was able to get just 50 yards, he could get in those aero bars and roll 2 or 3 miles per hour faster, probably. I had to be really on top of covering those moves. And then the sprint was pretty ugly. We were all cramping pretty hard. I don’t think it was a particularly pretty one. I was able to hold them off. I tried to post up at the line, but all the photographers were very very near on the other side of the finish line. Got some champagne in the face, so that was celebration enough. CXM: That seems to be a tradition. The champagne to the face. Happened at DK too. One thing I think is really interesting about that last group is you had Drew, who is known for cyclocross, you’re known for your mountain biking, Ted obviously for his road racing. What is it like sizing up guys with different backgrounds. PM: That’s one thing that’s so cool about gravel. It brings together folks from different backgrounds. I know Drew decently well from racing Collegiate against each other. We were always kind of the anchors in the team relays for our respective schools, so we had some good battles back in the Collegiate days. He’s just a great guy and a good friend. After all the riff-raff of negative racing, it was so refreshing to have the three of us who know each other well, who trust each other professionally, who know how to roll a move together. We were kind of chatting and catching up. Another cool component of this gravel world is you get a little bit of everything from these gravel courses. There was this one section that was kind of this off-camber grass with really no dirt road or trail or anything. Ted and I were like, “Oh boy Drew, this is where you make your move.” Then there were some good dismount and run sections, and obviously Drew looked very pro through there. Then the trickier climbs suited me really well. Like I mentioned earlier, gaps seemed to fall into my lap in those sections. I think part of that is bike choice is such an interesting dynamic in these things. CXM: Yeah, what did you ride? PM: The courses are so diverse. You’ve got pavement, you’ve got practically mountain biking, you’ve got everything in between, so you can’t have the perfect bike for everything. I’ve got a good amount of trust in my fitness right now, so I’ve been gravitating toward a more aggressive, more capable setup. I was on my Trek Checkpoint, and I was running 40c Maxxis Ramblers. Which were definitely higher volume and knobbier than other folks were running. What that meant though is I was able to ride the more technical sections quite a bit faster than some of the other folks, it seemed like. I was a little bit nervous as it was coming down to the line because Ted had a very fast, very slick tire set up, and I knew that was going to roll a little bit faster in a sprint. But you kind of just have to make those choices and hope that it works out. It’s just cool how there are decisions to be made, equipment-wise. There are decisions to be made tactically. Different parts of the course suit different rides, so you always have to be on your toes, playing out the various situations. CXM: What did you think overall of the Land Run event? Was it worth the trip? Obviously, you won, but even if you didn’t? PM: Oh yeah. Absolutely worth the trip. The race promoter Bobby [Wintle] is about the most enthusiastic race promoter I’ve ever seen. His level of energy is kind of ridiculous. It was from sunup until I think midnight when the last rider rolled through. He gives everyone a hug. That energy permeated the whole event. It was very well run. The passion for cycling that the Midwest has is really impressive. But when you look at the start list, it was incredibly diverse. There were people from all over. It wasn’t just centralized to the Midwest. It sold out super fast, and the wait list they had was really long. It’s really good to see racing thriving like this. It’s really encouraging as a professional to know there’s a healthy ecosystem to support a career. There’s live music and lots of events going on. Just so much going on other than the race itself, which I think is really key. It’s a celebration of bikes and living a healthy life. CXM: Coming up, what other events should we look for you and your mustache at? It’s iconic. PM: That was a funny thing. It was sort of a bet a couple years ago right before the Iceman Cometh race. And for whatever reason, people just really latched onto it. I’ve sort of been stuck with it, and now I’ve really embraced it. You’ll see some fun kind of projects coming out in the next couple of months. I’ve got a pretty packed schedule. The next major goal isn’t a sanctioned race. It’s a Red Bull Project. It’s a Fastest Known Time project. I’m trying to set a new White Rim record in Moab, Utah, which is a really iconic 100-mile loop in Canyonlands National Park. And then it’s a really traditional schedule on the mountain bike side. I’m really focusing on the Epic Rides series. I’ll be at the Sea Otter Classic, as much for the off-the-bike stuff as the racing. I have my Marathon Mountain Bike Nationals title to defend. I’m going to add a couple stage races this year. I’m going to do the BC Bike Race, and there’s a pretty big UCI stage race in Israel. It’s a pretty packed schedule, probably 90 percent mountain bike stuff. I think theoretically I am going to try to do Kanza again, and there might be a couple of other gravel events in there. CXM: I was listening to that list waiting to hear Dirty Kanza. You’ve got some unfinished business to take care of there. PM: To be totally honest, it’s funny because I am kind of known as more of an endurance guy these days, but boy, an 11-hour race is just so daunting. And it puts such a hole in your season, both from a training standpoint and a recovery standpoint. The difference between a three-hour relatively high-intensity mountain bike race and an 11-hour race is just so big. But yeah, I’m gonna give it a shot. It’s a very important race on the North American schedule, and I get asked about it as frequently as much as any other. CXM: Awesome. That’s good to hear. Hopefully, I will see you at Kanza, but we’ll also be following what you’re up to the rest of the season. It’s cool that there are so many bike racers like you who can do a bit of everything. PM: At like I said, gravel is the perfect neutral playing field, sort of. I think it’s cool that riders from so many different backgrounds come together to test themselves against each other. I really enjoy that aspect. CXM: Thanks for your time. I really appreciate it. Have a great rest of your drive home. PM: I appreciate that time. Thanks.